The voters who backed Bernie Sanders during the Democratic primaries differed from those of Hillary Clinton on several major issues. But in most cases, these gaps were dwarfed by the gulf between the backers of either Democratic candidate and Republican voters. On nearly all issues where Clinton and Sanders backers diverged, they did so because Sanders supporters were more to the left of Clinton supporters and further away from the opinions of GOP voters. One example is national security: About half (51%) of Democratic and Democratic-leaning registered voters who supported Sanders for the nomination said their bigger concern was that government anti-terrorism policies had gone too far in restricting civil liberties, while 33% were more worried that they have not gone far enough to protect the country, according to an analysis of surveys conducted in March and April, during the heat of the primary campaign. Opinion among Clinton supporters was nearly the reverse: 51% worried more about anti-terror policies not going far enough, while 35% worried more about them going too far. Among all Republican and Republican-leaning voters, nearly two-thirds (64%) said their bigger concern was that U.S. policies would not go far enough in combatting terrorism, while just 22% worried more about restricting civil liberties. Explore change and stability in the race for the Democratic presidential nomination over the course of 2015 and early 2016. 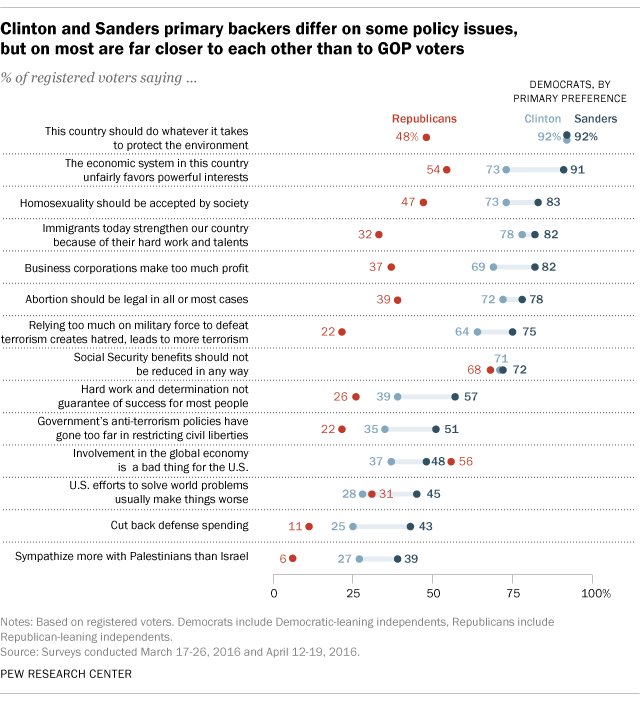 On this and other issues, the views of Clinton supporters fell about halfway between those of Sanders supporters and those of Republican voters. For instance, an overwhelming share (91%) of Sanders supporters said the economic system in this country unfairly favors powerful interests. A smaller, but still sizable majority (73%) of Clinton supporters said the same. Among Republican and Republican-leaning voters, 54% viewed the economic system as unfair. On several other issues – including the environment, immigration, abortion and homosexuality – there are, at most, modest differences between Sanders and Clinton supporters. And in each case, there were substantial gaps between the primary supporters of both Democratic candidates and Republican voters. 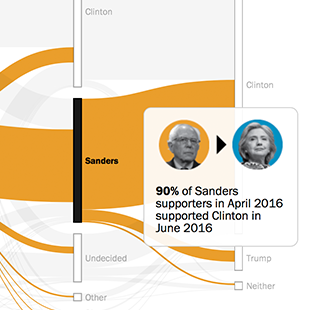 An analysis of Democratic voters over time found that as of June, those who had supported Sanders for the Democratic nomination overwhelmingly back Clinton against Trump in the general election.